It only takes a quick Google search to see it. The hottest diet of the past few years is the Ketogenic Diet. In fact, it was the #1 searched diet of 2016. First, it can and does work quickly for weight loss. Second, it’s extremely therapeutic and diabetic friendly. Third, it allows you to over-eat many of your favorite ‘fatty’ foods that your doctor would normally tell you are ‘off limits, but in reality they can be extremely healthy once the body enters a true state of what’s known as ‘ketosis’. Yummmmm…. I can smell the steak and bacon sizzling right now. Endurance athletes… bodybuilders… seniors… diabetics… heck, even Navy Seals are touting the amazing benefits of the ketogenic diet. Inside this free article you’ll discover why this hot trend is bound to stick around for years to come. Charlie Abraham had no success controlling his seizures as a child. No medicine nor brain surgery helped. When he was 5 years old, his family put him on the ketogenic diet (developed by Dr. Russell Wilder at the Mayo Clinic in 1924), and within a month he was seizure-free. He remained seizure-free even as an adult. As a result, his family started the Charlie Foundation in 1994. The Foundation is a global leader that tries to help epileptic patients through ketogenic diets. (Incidentally, when better meds came out to control seizures, the ketogenic diet was eventually ignored). This foundation is also an educational resource center for anyone searching for information about the ketogenic diet. The state known as ketosis results from following a very low carb ketogenic diet (VLCKD), which allows the body to shift gears from burning glucose to burning ‘ketones’ as its primary fuel source. Normally, your body needs glucose to function properly. It’s your body’s primary fuel. Your brain and central nervous system (CNS) run on glucose. But when you carb-down drastically your liver has to ramp up the process of producing ketone bodies from fats. Eventually, your body becomes “keto-adapted.” This means that it is now getting its fuel from fat and instead of glucose. This process can take anywhere from 1-2 weeks on average but can take a few months in certain individuals. In other words, the goal of the ketogenic diet is to get you into a metabolic state known as ketosis. Once you enter ketosis, your brain and body begin to use ‘ketone’ bodies for a primary fuel source—instead of glucose from carbs and proteins. Ketones, which are produced in the liver from fat, replace glucose as your bodies daily fuel source. Because you no longer access sugar to burn energy and your insulin levels have been stabilized… your body has no choice but to use fat. We’ve been told all our lives that our brains need sugar to function. But in the absence of sugar your brain has the ability to adapt to burning ketones to keep it functioning. Ketosis is how the body makes sure that the brain can run on fat stores too. The trick here is not only to avoid all obvious sources of carbohydrate (sweets, bread, spaghetti, rice, potatoes), but also to be careful with your protein intake. If you eat large amounts of meat, eggs and the like, the excess protein will be converted into glucose in the body. Large amounts of protein can also raise your insulin levels. This compromises optimal ketosis. The biggest difference between this and the Atkins Diet is the restriction of protein. On the Atkins, you could eat all the protein you wanted but not on a ketogenic diet because proteins can also be turned into sugar (a process known as gluconeogenesis). And on a ketogenic diet you end up eating 70%-80% friendly fats. 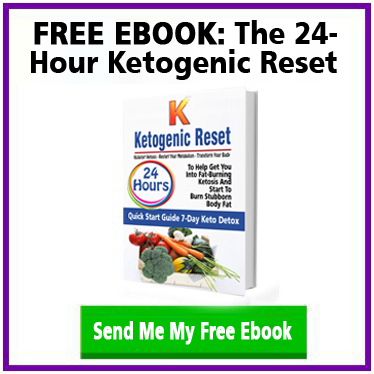 This is how your body can automatically shift into ketosis known as a very-low carbohydrate diet (VLCKD) or KETO for short. The ketogenic diet is a proven medical therapy for epilepsy that’s been used since the 1920s. Traditionally it has mainly been used in children with uncontrolled epilepsy despite medication. But epileptic adults have also seen major improvements. Even to the point of removing all anti-epileptic medicines. Ketosis is a state in which the body has an extremely high fat-burning rate. Even the brain runs on fat, via ketone bodies. These are energy molecules in the blood (like blood sugar) which become fuel for our brains after being converted from fat by the liver. Recent studies have shown that a low carbohydrate, ketogenic diet can lead to weight loss and improvements in insulin resistance. The amount of insulin in your bloodstream must be low. This encourages ketones to form. The lower your insulin, the higher your ketone production. And when you have a well-controlled, sufficiently large amount of ketones in your blood, it’s basically proof that your insulin is very low. That’s what’s called optimal ketosis. Chronically elevated insulin levels is what leads to diabetes. Eating a ketogenic diet is a great way to reverse diabetes because the low carb intake automatically stabilizes insulin levels. In fact, studies have shown that ketogenic diets improve insulin sensitivity by 75%. In one study 7 out of 21 participants were able to stop diabetes meds altogether. A common result of a poor diet is lack of mental clarity – also known as brain fog. The inability to focus on a task or recall information is commonly a result of this. Brain fog and a lack of focus, among other things, can be caused by having too much glutamate and very little GABA. What does this have to do with ketosis? Research has shown that ketones have the ability to allow the extra glutamate to be processed into GABA efficiently. This balance (increase in GABA production) helps to reduce the excess firing of neurons in the brain, leading to better mental focus. An added benefit of more GABA production in the brain has also been shown to reduce stress and anxiety. Polycystic ovary syndrome (PCOS) is the most common endocrine disorder affecting women of reproductive age. It is associated with obesity, hyperinsulinemia, and insulin resistance. Because low carbohydrate diets have been shown to reduce insulin resistance, several studies have shown positive benefits of a low-carbohydrate, ketogenic diet (LCKD) in overweight and obese women with PCOS. Despite high glucose availability, people with Alzheimer’s or Parkinson’s disease have brains that simply can’t utilize enough of it to maintain adequate cognition. Fortunately, ketones can act as an alternative energy source for these glucose-starved brains, which is why it’s no coincidence that ketogenic diets can improve symptoms and in some cases eliminate them altogether. In people with “mild cognitive decline”, rather than full-blown Alzheimer’s, a ketogenic diet has been shown to improve memory. Furthermore, if you’ve ever experienced ‘brain fog’ yourself, it could be from elevated ammonia levels and depressed GABA levels within your brain. Ketosis increases brain glutamine synthetase, and brain glutamine synthetase mops up extra ammonia. No more forgetting where the keys are or where you put your smartphone! Because the keto diet eliminates nearly 100% of fructose it can indirectly normalize blood pressure and potentially prevent blood pressure from rising to dangerous levels. Here’s why: 100% of fructose consumed is metabolized in the liver. The byproduct of fructose metabolism is higher insulin levels and more uric acid. Uric acid prohibits the production of nitric oxide, which increases levels of glucose, constricting blood vessels and raising blood pressure. Simply put, a diet that is low in fructose intake, like a keto diet, can help ward off this ‘silent killer’, which is nothing to mess around with. One of the biggest benefits of using a ketogenic diet is the improvement in HDL cholesterol and triglyceride levels. Twelve studies including 1,257 patients examined the impact of a VLCKD (very low carb ketogenic diet) on HDL (the good kind) cholesterol. The individuals assigned to a VLCKD achieved an average increase in HDL good cholesterol that was double that of the low-fat dieters. The authors concluded that carbohydrate-restricted diets increase cardiovascular health because they improve HDL levels inside the body. Bottom Line: A low-carb diet (typically under 50 grams daily) is an effective method in raising HDL cholesterol when compared to traditional weight-loss diets that emphasize reducing fat intake. A very low carb ketogenic diet is one of the most effective ways to help reduce acne because it controls insulin. Insulin can increase instances of acne because it stimulates the growth of skin cells and can block pores through several different pathways. breaking their dependence on being addicted to burning sugars. But after a few days of eliminating carbs and other sugars from their diet the cravings will subside as the body makes the ‘shift’ into ketosis and starts burning ketones as a primary fuel source. It’s not easy for anybody who loves their sweet treats, but if you can make it through the first 3 to 5 days you’ll be able to kick that sugar addiction to the curb! One of the biggest benefits seen in this type of diet is the reduction in tumor cells. Since sugar feeds cancer, not eating high carbs can starve out the cancerous cells. Cancer cells love sugar! Refined carbohydrates like white sugar, white flour, high fructose corn syrup (HFCS) and soft drinks are extremely dangerous for anyone trying to prevent or reverse cancer. Sugar essentially feeds tumors and encourages cancer growth. Observational studies support the idea that processed carbohydrates may be at the root of the ADHD problem. In a large, well-designed study published in 2011, it was clearly shown that a diet change (including less sugar and processed food) reduced symptoms in most kids with ADHD. Between Nov 4, 2008, and Sept 29, 2009 100 children were enrolled and randomly assigned to the control group or the low carb diet group. When the children were reintroduced to a higher carb intake the relapse of ADHD symptoms occurred in 19 of 30 (63%) children. Another possible explanation for why ADHD is controlled in lower carb diets is that large amounts of processed carbs may induce large swings in blood sugar. As the blood sugar goes down rapidly again (an hour or two after a meal) the body may have to release stress hormones like adrenaline to avoid low sugar. This may accentuate symptoms associated with ADHD. Avoiding processed carbs may stabilize blood sugars and thus avoid this problem. People often confuse ketosis with ketoacidosis. The former is natural, while the latter only occurs in uncontrolled diabetes. Ketoacidosis mostly affects people with Type 1 diabetes. In fact, it is the leading cause of death of people with diabetes who are under 24 years of age. Ketoacidosis is dangerous, but ketosis on a ketogenic diet is perfectly normal and healthy. NOTE: If you have type 1 diabetes, you should not attempt to use a keto diet without talking with your doctor first. By now you know that the primary trick to getting into ketosis is to avoid almost ALL obvious sources of starchy or sugary carbohydrates (sweets, bread, spaghetti, rice, potatoes). However, if you eat too much protein (meat, poultry, eggs, dairy, seafood, etc.) the excess protein will be converted into glucose in the body—a process known as gluconeogenesis. In other words, consumption of too much protein on a ketogenic diet can also raise your insulin levels, which can kick you out of ketosis. Fasting: A fast quickly induces ketosis. You’re not eating anything, so your only option is to consume your own body fat. And to offset the lack of incoming glucose, your brain will run partially on ketones. It helps to be a strong fat-burner already, as you’ll start dipping into your body fat stores right away and everything will go more smoothly. Anyone who’s fasted without being fat-adapted can attest—it’s not easy, but once you’re there it’s very easy to use some type of intermittent fasting without getting hungry. Don’t eat too late: Even just a “fast” from dinner to breakfast is enough time to induce a bit of ketosis. By eating earlier and avoiding midnight snacks, you allow your body to start burning fat and converting it into ketones. You’ll know it when you have funky ketone breath in the morning; it’s a sign of a good metabolism. Consume medium chain triglycerides: Adding MCTs, found in coconut oil or isolated MCT oils, to a regular diet spurs the creation of ketones. You don’t even have to reduce carbs dramatically, but don’t try a high-carb, high-MCT oil diet either. Primal Endurance training: Low-level aerobic activity is awesome for starting ketosis. 180 minus your age equals the heart rate you need to stay at or under to maximize fat burning efficiency, lay your aerobic base, and upregulate mitochondrial biogenesis. Do this on an empty stomach and you’ll kick start ketosis. • Sugary foods: soda pop, fruit juice, smoothies, cake, ice cream, candy, etc. • Grains or starches: Wheat-based products, rice, pasta, cereal, etc. • Fruit: All fruit, except small portions of berries like strawberries. • Beans or legumes: Peas, kidney beans, lentils, chickpeas, etc. • Root vegetables and tubers: Potatoes, sweet potatoes, carrots, parsnips, etc. • Low-fat or diet products: These are highly processed and often high in carbs. • Some condiments or sauces: These often contain sugar and unhealthy fat. • Unhealthy fat: Limit your intake of processed vegetable oils, mayonnaise, etc. • Alcohol: Due to its carb content, many alcoholic beverages can throw you out of ketosis. • Sugar-free diet foods: These are often high in sugar alcohols, which can affect ketone levels in some cases. These foods also tend to be highly processed. • Meat: Red meat, steak, ham, sausage, bacon, chicken and turkey. • Fatty fish: Such as salmon, trout, tuna and mackerel. • Eggs: Look for pastured or omega-3 whole eggs. • Butter and cream: Look for grass-fed when possible. • Cheese: Unprocessed cheese (cheddar, goat, cream, blue or mozzarella). • Nuts and seeds: Almonds, walnuts, flaxseeds, pumpkin seeds, chia seeds, etc. • Healthy oils: Primarily extra virgin olive oil, coconut oil and avocado oil. • Avocados: Whole avocados or freshly made guacamole. • Low-carb veggies: Most green veggies, tomatoes, onions, peppers, etc. • Condiments: You can use salt, pepper and various healthy herbs and spices. • Fatty meat or fish. • A handful of nuts or seeds. • A low-carb milk shake with almond milk, cocoa powder and nut butter. • Full-fat yogurt mixed with nut butter and cocoa powder. • Celery with salsa and guacamole. • Smaller portions of leftover meals. Keto strips can serve as a good gauge, studies show that the only accurate method to see if you are in ketosis or not is to measure your blood levels. Below 0.5 mmol/L is not considered “ketosis”. At this level, you’re still burning sugars as your primary fuel source. Between 0.5-1.5 mmol/L is light nutritional ketosis. You’ll be getting a good start on your weight loss but it’s not considered optimal. Values of over 3 mmol/L aren’t necessary. That is, they will achieve neither better nor worse results than being at the 1.5-3 level. Higher values can also sometimes mean that you’re not getting enough food. Like most things in life, there are some drawbacks to the keto diet. While there are many benefits to being in ketosis, there are some downsides it’s important for you to know about. Although the ketogenic diet is safe for healthy people, there may be some initial side effects while your body adapts and switches its gears from burning sugars to burning fats (i.e. ketones). Keto flu includes poor energy and mental function, increased hunger, insomnia, nausea, digestive discomfort and decreased exercise performance. A ketogenic diet can also change the water and mineral balance of your body, so adding extra salt to your meals or taking mineral supplements can help. For minerals, try taking 3,000–4,000 mg of sodium, 1,000 mg of potassium and 300 mg of magnesium per day to minimize side effects. While in ketosis, there is a greater risk of losing lean muscle mass tissue. Insulin is a highly anabolic hormone and is one of the primary reasons why those who are attempting to gain muscle often load their diets up with extra carbohydrates. If you remove all the carbs on purpose, you lose this anabolic response. It also becomes very hard to sustain an intense weight lifting program on little to no carbohydrates because your muscles aren’t getting the weight lifting stimulus to help retain lean muscle mass that they normally would. While some people function great in ketosis and could stay in this state forever, they are not the norm. Many people find they just don’t feel as good as they did when they were eating more carbs. Some people feel downright miserable on a keto diet. These people are not the norm though but if you are one, that’s good indication that you should consider stepping away from this diet protocol. The normal advice to help relieve constipation includes drinking enough water, increasing non-starchy, fibrous vegetable intake, and using sugar-free candy containing sugar alcohols as a mild laxative. If you have tried these ideas and they haven’t worked for you, or if you have trouble with constipation no matter what kind of diet you eat, here is a study to show you that fiber is not necessarily the magic “cure-all” for constipation. Most people believe that constipation is caused by a lack of fiber in the diet, but this may not be so because constipation is usually caused by something you ARE eating, not by something you’re NOT eating. If you experience constipation on a ketogenic diet, it may not be because you are eating less fiber; it is probably because you have started eating something that you were not eating before (that is hard for you to digest). In order to eat a ketogenic diet, which is a high-fat, limited protein, ultra-low-carb diet, most people find themselves turning to high amounts of foods that are notoriously difficult to digest, including nuts, low-starch vegetables such as crucifers, and full-fat dairy products. Additionally, low carb foods like cucumbers, tomatoes, squashes, avocado, okra, and olives will aid in speedy digestion. Personally, I find that most people who experience constipation on a ketogenic diet are those who are not drinking enough water. Try to get at least 75 to 125 ounces of water daily when going keto… or following any diet for that matter. Here’s an overview of the Pros and Cons of the ketogenic diet plan. This makes for the perfect snack any time during the week or can also be taken with you for a great lunch at work. Pair it with a plain salad with some full fat salad dressing and you’ll be all set. Place eggs in a pot full of water. Bring to a boil and then turn down to a simmer. Cook for 10 minutes. Once done cooking, let stand for 5 minutes in ice cold water. Remove eggs from shell and scoop out the yolks. Mix the yolks with the remaining ingredients and then place back into the egg white shell. Serve immediately. Craving chocolate? Being on keto doesn’t mean you can’t indulge. These delicious frozen cups will satisfy any craving in a hurry and offer great antioxidant support thanks to the cocoa powder in the recipe. Let butter and cream cheese sit out of the fridge for about half an hour to soften. Once soft, mix together. Beat in the cocoa powder and sweetener with an electric mixer. Break chocolate bar into pieces and then mix in. Once everything is mixed together, place into small cupcake molds and place in the freezer. Freeze until set and then remove before serving. Ice cream lover gone keto? We’ve got you covered. This delicious recipe packs in healthy fats from the coconut milk that can help lower inflammation, combat hunger, and boost brain function. It’s one recipe you can feel good about serving yourself. Mix all ingredients together except the raspberries. Once well mixed, either add to an ice cream maker or place in a Tupperware container. Add the raspberries. Start the ice cream maker or else give the mixture a stir. Place in the freezer and stir at 30 minute intervals until desired consistency is reached. Serve immediately. In a hurry for dinner? Try this cheesy turkey meatloaf recipe. It’s the perfect dish to help boost your protein intake while bringing in some added calcium to your diet plan. What more could you ask for? Preheat oven to 350 degrees. Mix all ingredients together in a large bowl and then cook for 35-40 minutes in loaf pans or until done. Serve immediately. Snacks can be hard on keto but this muffin recipe is an easy decision. These make for a light and fluffy treat when all other baked goods are completely off limits. Serve these up and satisfy those cravings for sweets the keto way. and vanilla. Beat in one egg until the mixture is fluffy. Add a third of the dry ingredients. Stir again. Add the next egg and continue beating so it’s fluffy. Add half of the remaining dry ingredients and beat some more. Add the remaining egg and repeat the process. Add in the heavy cream and coconut cream. Stir and then fold in the blueberries. Pour into the muffin tins and then top with dried coconut flakes. Bake for about 25 minutes or until they feel firm but still moist. Serve immediately. What Do Successful Ketogenic Dieters Know That You Don’t? Most keto dieters are giving up all carbs and that’s NOT a good idea. Giving up carbs can be good for in the short-term, but give them up for too long and you’ll find yourself gaining weight all over again. The solution is to start a keto diet with the end in mind. I prefer a metabolic approach to the ketogenic diet…. Enter The Ketogenic30 to help you lose 9-21 pounds in 30 days AND keep it off by focusing on health, metabolism, and hormones.